Hmm, sure. Let it be known that I feel a bit silly writing a post about packing tips, because to be honest, I tend to roll my eyes at a lot of blog posts giving advice on how to pack ones bag for travel. So maybe this will be more a list of “Things I think about while packing” as opposed to the typical “11 Tips for Packing Your Best Bag!” Lame. I get bored of repeatedly being told to buy packing cubes. I am not going to buy packing cubes. Go on! Keep telling me how great packing cubes are, but I will never buy any. Why? A few reasons. Any budget traveller knows that their money is better spent on the in-destination experience rather than an organised bag. From what I can tell, packing cubes cost between $15 and $40 CAD. Do you have any idea what that money can get you in India? In China? 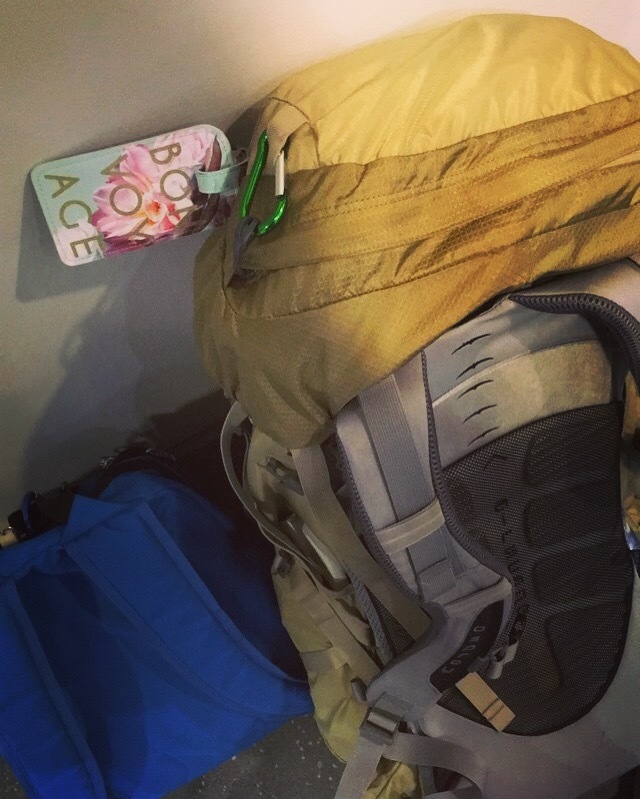 Not to mention…how well do packing cubes work in a backpack? Plus, I feel that the space taken up by the bottom and sides of said packing cube is actually precious space in which I can shove a pair of socks or a zipper bag of tampons or Q-Tips…you get the point. Space is essential in a backpack and I’m not about to waste precious centimeters on a packing cube. Things I think about while packing! Eye glasses: A couple days ago,while getting most of my things together for China, I switched glasses. I normally wear the same pair all the time, but I have learned that I never learn. I have lost three different pairs of glasses in three different countries. So now, I switch to my less expensive glasses a few days before departure to let my eyes adjust. This way, when I stubbornly step into large bodies of water whilst wearing my glasses, it won’t be so bad if/when I lose them. And yes, I pack a second pair for back-up (I don’t do contact lenses). A Scarf: Preferably a wide, open-ended scarf. Not an infinity scarf (unless you want to pack one for fashion purposes, which I sometimes will). A scarf with these specifications can come in handy in a multitude of ways. Are you cold? Wrap that scarf around your neck. Too hot? Soak it in water and then wrap it around your neck. Visiting a religious site where you need to cover your head and shoulders? Good thing you have that scarf! Did the zipper on your bag just bust open? In a pinch, tie it closed with your scarf. Need a pillow? Scarf. Need a blanket? Scarf. Point being, I always take a scarf. Underwear: Yeah. I’m about to talk about my underwear. Let’s just agree now to be real with each other, okay? You know and I know and we all know what we have in our underwear drawer. We have the old, torn, elastic-band-falling off pairs of underwear. They are washed and clean, but they’ve been through one two many dryer cycles. These underwear are precious to me. I intentionally do not throw out the old pairs, because I pack them for a trip…so that I can leave them in a foreign country. Get your mind out of the gutter, I’m referring to the trash bin. I’ve done this for years! I decided to take a tip from a fellow traveller (D.K.) and bring one pair of underwear for every day of the trip. I regretted not doing this for India, so this time it’s happening. And you better believe that the oldies were the first ones to be packed. I wear and toss. Doing this makes room in my bag as I go and I do not have to worry about carrying around, packing and re-packing dirty underwear. Are we all uncomfortable now? Good. Let’s move on. Capsule Wardrobe: If you have a Pinterest account, then you already know this not a new concept. For me, I only started paying attention to this after seeing how incredibly well my Varanasi roommate (K.S.) had packed her clothing. She seemed to be wearing a new outfit each day, but in actual fact I think she probably had ten pieces of clothing in her bag (not counting socks and underwear) for a three-week trip. I gave the capsule wardrobe some proper thought before going to London last October and with practice I’m sure it will improve for every trip. Basically, pack clothes that can work themselves into multiple outfits (meaning more than two) and you won’t have to bring so many clothes with you. Shoes: This is another item that I find people go overboard with, especially since it’s a fairly subjective decision. I once saw a suggested packing list that told me to bring five pairs of shoes. FIVE! FIVE?! Are you nuts? I suppose it depends on the type of travel you’re doing, bur for me it’s sandals, good walking shoes and a small lightweight pair of cute tennis shoes. Or flats. No heels. No boots. No need. You can roll your clothes, buy packing cubes, vacuum pack your socks, fold everything into a weird bundle in order to get everything stuffed in your bag. But what it really comes down to is just being realistic about what you will use and what you need. Do you really need that fourth pair of pants, or can you make it with just three? What will be available to you in destination? Shampoo. Soap. Toilet paper (actually, maybe not toilet paper). What are you bringing that you can leave behind on your way back home? Old underwear. Sunscreen. Lotions. Your cheap flip-flops. Bring a light load to begin with and minimize it even further throughout your trip. That’s all I got for you…or at least all I can remember right now. In all honesty, I can survive as long as I have my passport, bank card and Isaac. Do you agree or disagree? Any tips you can share with me?